If getting the best cutting speed is your top priority, the Milwaukee M18 Fuel Super Sawzall is the current leader. The only question you'll have to answer is whether the size and weight are more than you'd like to wield for demolition duties. 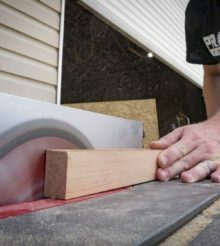 Milwaukee announced their latest breakthroughs at NPS18 a couple of months ago and we were able to get our hands on the new Milwaukee M18 Fuel Super Sawzall. This is the first cordless model to earn the Super Sawzall name and it’s built around Milwaukee’s new High Output battery. Let’s take a look under the hood and run it through some of our standard tests to see how it fares. Prefer video? Check out our very first impressions of using the saw! With the “Fuel” designation, the Milwaukee M18 Fuel Super Sawzall gets a brushless motor. It’s not just a standard Fuel motor anymore though. Milwaukee moves into more intentional large frame and small frame brushless motors. Power hungry animals like this get a bigger motor to back up the claims of being able to outperform 15-amp corded models while tools like impact drivers can stay compact. The motor is only part of the story – it’s Milwaukee’s new High Output 12.0 Ah battery that completes the power circuit. 21700 cells combine with heat dissipation and efficient power delivery to put out more watts than Milwaukee’s standard M18 batteries. Orbital action is a big deal on reciprocating saws and the lack of it on Milwaukee’s M18 Fuel Sawzall – even the One-Key model – hurt its head to head cutting performance in wood. That’s not the case with the cordless Super Sawzall, so we expect Milwaukee’s cut times to shrink. The Milwaukee M18 Fuel Super Sawzall checks off just about every box you can hope for in this class of tool. However, a couple of things detract slightly from its otherwise excellent feature set. It’s all about the blade clamp here. The M18 Fuel Sawzall clamp release uses a lever on the outside of the front housing. It works well no matter what position the shaft and shoe are in. Milwaukee moves away from this on the Super Sawzall to give you just a standard shaft release. It’s still tool-free, but I find that I have to feather the trigger to make sure that it’s high enough to get my fingers around. I’d also like to see Milwaukee shift to an auto-clamping blade lock. It’s a small thing that a couple other manufacturers add and gives the convenience factor a bump up. One-Key isn’t an available option. At least not yet. The ability to dial in the exact material and blade you’re using so the system can optimize the settings is one of the most direct effects on performance we’ve seen so far, so here’s hoping it makes its way over. There’s no getting around it – this is a heavy saw. The Milwaukee M18 Fuel Super Sawzall weighs in at 8 pounds, 13 ounces bare and a whopping 12 pounds, 3 ounces with the 12.0 Ah battery. Its physical footprint is large as well, stretching to a length of 18.9″. While the front handle overmold has more cushioning than most saws we’ve tested, let’s hope it has the muscle to justify its size. The Milwaukee 2722 looks impressive on paper. The 3000 SPM stroke rate puts it near the top and the 1-1/4″ stroke length matches the best that’s out there right now. With the new battery promising to provide more power to reduce bogging down and the addition of orbital action, it’s certainly a pre-race favorite. I wanted to know where this model fits among the other saws we’ve run through our standard battery of tests. For speed, its cross-cutting through 2 x 12 PT with five 16D nails embedded in it. Our current speed champion on the cordless side is Ridgid’s Gen5X at 9.54 seconds in our shootout a while back. So how does Milwaukee do? It made the cut with a single fastest time of 8.76 seconds and an average cut time of 9.12 seconds. You’re looking at out new speed champion! I also spent some time cutting in 5/8″ rebar to see how it does in thick metal. This is the kind of application where having that variable speed dial really helps to extend the life of your blade and hopefully control the chatter. Unsurprisingly, it cuts very well and has an average amount of vibration, though the thickness of the front overmold helps absorb some of it. As a kit with the 12.0 Ah High Output battery, you’re looking at $399. That’s the same price as Bosch’s GSA18V-125 Core 18V kit. It’s also about $50 more than the FlexVolt 2-battery (6.0 Ah) and Makita’s 18V X2 LXT 2-battery (5.0 Ah) kit. With performance where it stands, that’s a pretty competitive price and it gets your hands on the newest high-performance battery. If getting the best cutting speed is your top priority, the Milwaukee M18 Fuel Super Sawzall is the current leader. Its price is competitive and it checks off all the features you need on a Pro-level reciprocating saw. The only question you’ll have to answer is whether the size and weight are more than you’d like to wield for demolition duties.